There is no one who hates overpaying for anything more than I do. Absolutely no one. I promise you. State Farm Canada’s new Telematics App allows you to save up to 25% off your car insurance premiums just for being a good driver. Added bonus? Until July 31st, you also have a chance to enter and win 1 of 50 – $100 Amazon gift cards. I know I’m a good driver. No, really. It’s the rest of the people on the road who are a problem. I swear. And the Telematics App can help prove it. Simply download it from the iTunes or Google Play store and let it do it’s thing. Based on how, when, and how far you drive, you could save big when it comes time for your next car insurance renewal. What is important to note here, folks, is to not use your phone while you are driving. The app will do it’s thing while you carefully accelerate and take curves at a reasonable speed. My grandmother tells me she can always tell how old a driver is by how quickly they accelerate from a stop. Trust me – this app is even more accurate than she is. Thinking you’d like to keep an eye on your new driver and make sure they aren’t drag racing somewhere? Or doing burn outs? Or using that phone they have glued to their hand while the car is in motion? Have Telematics downloaded onto that extra appendage of theirs and keep an eye on things from afar. Even if you aren’t sure you *need* an app like this to tell you what a great driver you are, you can still enter to win a $100 Amazon gift card. Useful for things like GPS devices so you don’t get frustrated while driving. Hey – it’s just a suggestion. Feel free to do whatever you’d like with said winnings. I’m not that much of a bossy pants co-navigator. Note: Contest closes July, 31st, 2017 at 11:59am EST. This contest is open to Ontario residents only. No purchase necessary. See full Contest Rules. 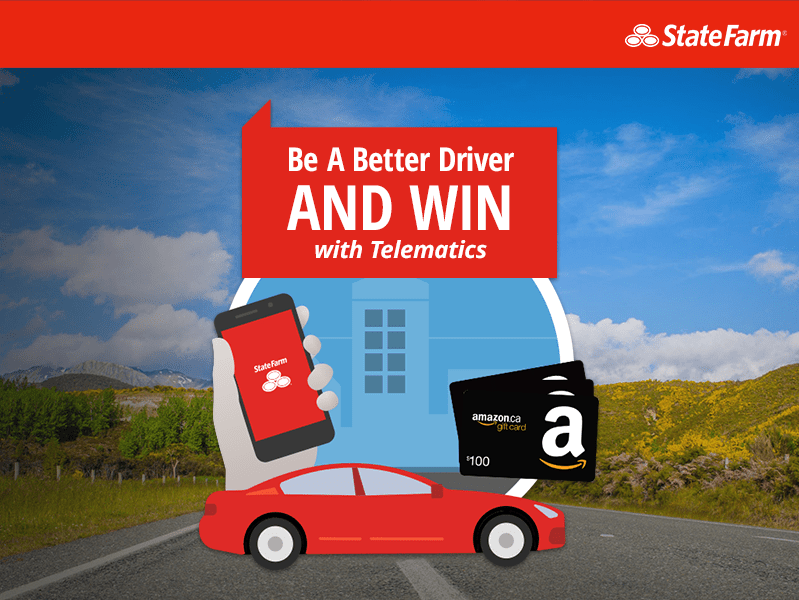 Disclosure: I was compensated for writing this post, letting you know about State Farm Canada’s Telematics App and the contest.